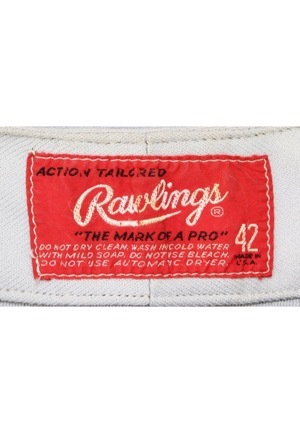 In the rear collar is the Rawlings manufacturer’s tag size “42” with washing instructions. On the front left tail is the year “72” embroidered in blue chain stitching. 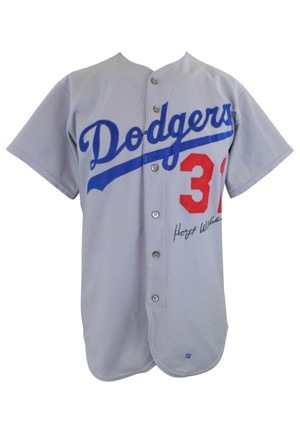 Across the chest reads “Dodgers” in Dodger twill script style writing. 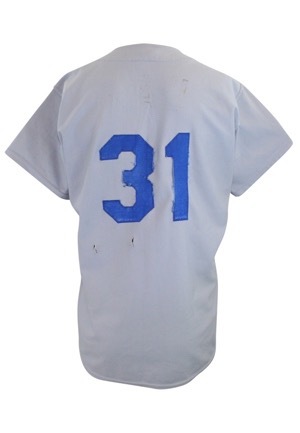 Adjacent below is the player number “31” in red tackle twill. Across the back is the player number “31” in Dodger twill. The player name “RAU” has been removed but the outline is still present. Both Doug Rau and Hoyt Wilhelm wore number 31 in 1972 with Wilhelm having pitched 25 innings for the Dodgers in his final season. It is possible Wilhelm wore this jersey as well as Rau. 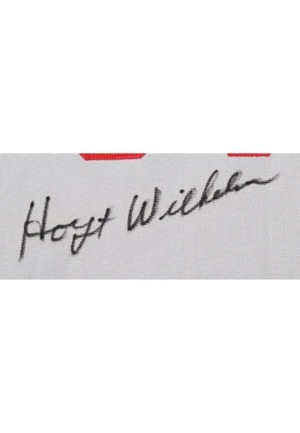 Wilhelm signed the front of the jersey in black marker and in our opinion the signature rates an 8. This jersey is properly tagged, was presented to us as game-used and in our opinion shows outstanding extended organizational use. Accompanied by a LOA from JSA.